Last year we were delighted to welcome Jack Baldwin, project research for the Glasgow Incunabula Project, to the College to view the five incunabula (i.e. 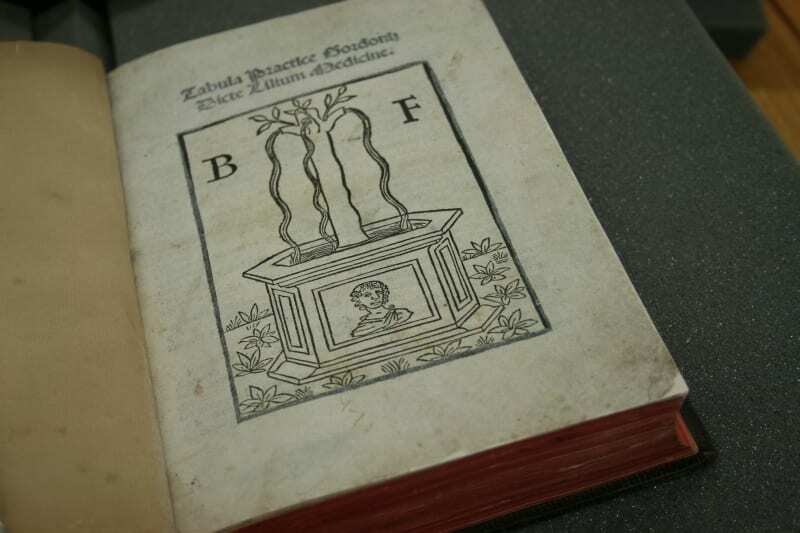 books printed before 1501) held in our library. Jack spent a considerable amount of time meticulously poring over each of these books, recording various bibliographic details, including information on their decorations, annotations, bindings, and any imperfections in the copies. We are very pleased to report that records for each of the books, along with Jack’s findings, have now been added to the project website. The oldest of the five, and thus the oldest in our collections overall, is a 1479 edition of the Liber Aggregatus of Serapion the Younger. This is a medieval medicinal-botany text which, like many early printed texts, enjoyed great popularity in manuscript form before the arrival of the printing press. Printed in the same year and bound in the same volume as this book is the Breviarium medicinae of Serapion the Elder. Despite the similar names, the two authors are not known to have been related. They lived four centuries apart, but both wrote on medicine and their work was often confused by later readers. Both works were printed at Venice by Reynaldus de Novimagio. Moving forward chronologically we arrive next at the Carmen Medicinale of Quintus Serenus Sammonicus, a Roman physician who died in AD 212. The text in this edition, printed in 1488, gives a series of incantations against illness and does not add much practically to the art of medicine, but does at least provide some insight into ‘popular’ medicine in the ancient world and indeed in the middle ages. This work was actually printed as part of a much larger work, including a number of different authors. The text by Serenus was obviously rebound on its own at some point before its acquisition by the Faculty Library in the early 19th century. 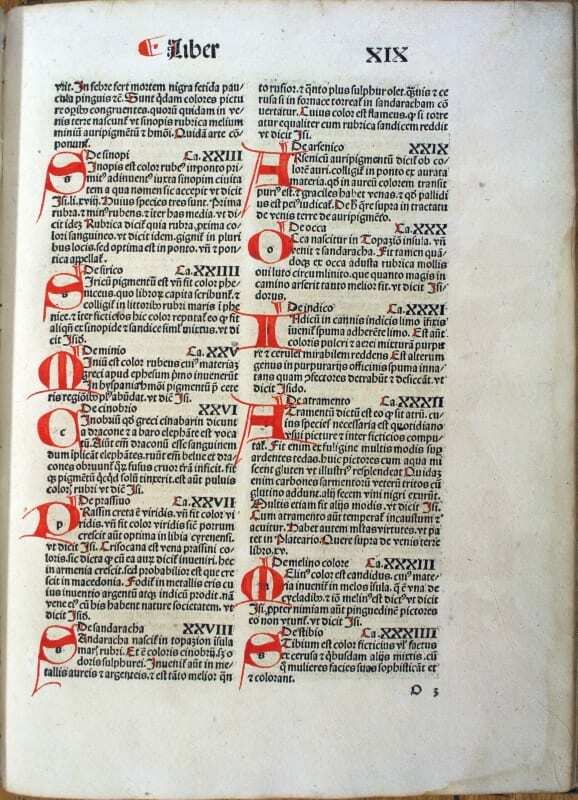 Next, printed in Strasbourg in 1491, is De proprietatibus rerum by Bartholomaeus Anglicus.Early printers often left spaces for large initials at the beginning of a page or paragraph, so that the initials could be filled in by hand and in colour. The College’s copy of De proprietatibus rerum shows plenty of examples of this, albeit with some less than perfect manuscript work. 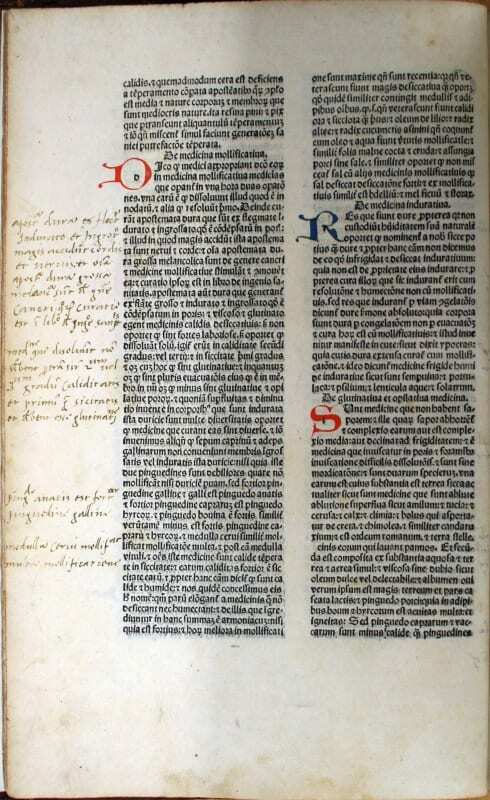 Bartholomaeus, the original author of the work, was a 13th century Franciscan scholar, and his text here can be seen as a medieval precursor to the encyclopaedia. The text itself remains valuable today as it provides modern scholars with a picture of the state of knowledge during the life of the author. Finally, there is Practica, seu Lilium medicinae by Bernard de Gordon. Bernard was a French doctor of the 13th/14th centuries, and this is a copy of what is arguably his most important work, giving lists and descriptions of diseases thought to be contagious. This particular edition was printed in Venice in 1496 or 1497. Glasgow University Library also holds a copy of this edition, a part of the Hunterian bequest of 1807. These two copies appear together on the project website, and one can see the differing ways in which supposedly identical books can appear to modern users. The books both feature their own annotations, are bound in different styles, and show evidence of the different paths they have taken from owner to owner until reaching their present location. The Glasgow Incunabula Project website now includes all 1,060 incunabula held by Glasgow University, the 5 held by the College, and 1 held by Strathclyde University, and records are now being added for items held at the Mitchell Library. You can find out more on the project website and follow progress on the project blog. Great project, glad I’ve found out about it. 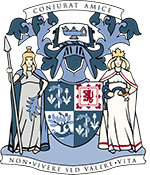 The College’s heritage collections – including thousands of medical and surgical instruments, rare books, archives, and pictures – span over 6 centuries and are an excellent resource for exploring the history of medicine and the history of the city of Glasgow. Many items from the collections have been digitised and are available to view here. Our digitisation work is ongoing, and we add new items to the site regularly, so keep checking back to discover more.